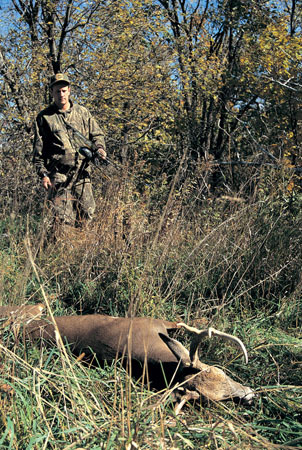 Here’s a strategic, three-pronged approach to hanging your buck opening week. The very best stand for opening day is found very close to the edge of a field or food plot. This location is the most consistent producer and the easiest to identify of all the early season options. Start glassing fields about two weeks before opening day. All summer the bucks have been wading belly deep in protein-rich crops like soybeans, clover and alfalfa and doing it undisturbed. These are great places to find them just before the season opens, too. Ideally, you’ll find a secluded corner of the field that’s not visible from any roads. Bucks feel safe coming out in these hidden spots and will fall into a more consistent pattern than they would where they are more visible. Don’t even scout the area on foot so you won’t leave anay human scent. Do everything from a distance with a good set of optics. One thing about bucks on a feeding pattern: they’re sensitive to hunting pressure. If they detect any human presence they’ll completely stop using that particular field, or they’ll use it only after dark. Keep all the deer using the food source from knowing that you’re hunting them for as long as possible. Even if the only deer you educate are non-target animals, your chances will suffer. When the does and small bucks get spooky, their body language will send a message to the mature bucks that they should immediately stop using the field. There’s no rut and no urgency to cause them to ignore danger signs. The bucks have nowhere they absolutely have to be and nothing they absolutely have to do, so they can wait until dark to feed or simply relocate to a different food source with little provocation. The strategy: Obviously, given this behavior, it’s important to get your ducks in a row before putting up a stand. Watch and learn first–think before you jump. 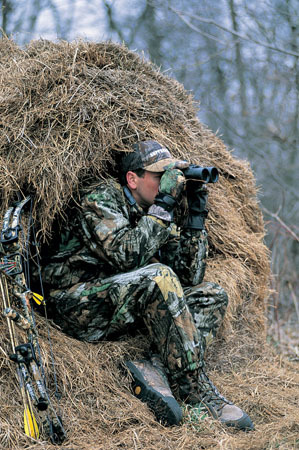 Stake out several potential feeding areas and study them for a few evenings with binoculars or a spotting scope. Stay at least a quarter-mile away so you can sneak in and out without being noticed. The most important step in early-season success is merely to pinpoint two different fields that are being used by good bucks. It’s important to have more than one spot because the odds say you’ll mess up the first one before the week is out. Plus, you need a couple of different areas so you still have a place to hunt if the wind switches. Notice the trails bucks are using and what time they come out. You’re going to need to know this so you can get back to your vehicle without spooking them after an evening of hunting. Placing the stand: To keep human scent to a minimum, wait until the first day of the hunt to actually put up your stand. If the big buck stumbles across your scent on the ground and gets spooky it may as well be while you’re standing over him at full draw! Go in early the first day and very carefully and quietly get the job done. Don’t cut too many shooting lanes or make many tracks. Go straight to the spot you feel offers the best compromise between staying undetected and being close enough for a shot. Ideally, your stand should be just a little ways back into the timber from the field edge, but still close enough that you can shoot at any bucks that are walking the edge. From here you give yourself the best chance of getting down from your stand and sneaking out the back door (through the timber) when it’s time to leave. Timing: Hunt the field edges only in the evening. Even if there are still deer in the fields in the morning, getting to the stand without spooking them will be tough because many of the deer (especially the older bucks) will be heading back toward their bedding areas before first light. It’s not worth the risk. You can hunt field edges all season long, without risk of running deer out of your hunting area. Hunt here as long as it is productive. They will, however, eventually find different feeding areas or become more nocturnal because no matter how cautious you are, the bucks will soon figure out they’re being hunted. Stand #1 will start to become less productive when rising testosterone levels in the bucks make them ornery and solitary. If you aren’t seeing the bucks at the field edges you need to go a little deeper into the timber. This brings us to Stand #2 in the succession. If you study the trail systems used by deer during the summer and early fall (prior to the rut) you’ll notice one thing they all have in common: an hourglass shape. The trails spread out and disappear as you get close to the bedding areas and they again fork off (though not as dramatically) into several smaller trails as you get close to the feeding area. That portion in between, the main arteries where the trails tend to come together, are great locations for early season stands. Stand #2 is my second choice for the first week of the season. It presents slightly greater risk of disturbing deer in their bedding areas, but it also gives you an advantage. Since the deer will get to this stand earlier in the evening than they will Stand #1, you might be able to catch those bucks that aren’t entering the field until after legal shooting time. I also like this stand because you can get away from it without spooking deer at the end of the hunt. In theory, they’re already past you and into the field. Forming the strategy: There are two challenges to overcome when hunting the bedding-to-feeding bottleneck. First, you have to find the spot. This requires on-the-ground scouting, something that should be avoided whenever possible. If you know of a couple of great bottlenecks from your post-season scouting, you’re ahead of the game. If you don’t, then you’re running the risk of educating deer by looking for one just before the season. Do what you gotta do, but do it carefully. The second challenge revolves around the approach routes you’ll take when going in to hunt the stand. The closer the stand is to a bedding area, the greater the chance that you’ll be detected while in transit. A great low-profile entry route can offset this risk. Keep to ditches, creeks and cover breaks as much as possible, so you’ll remain out of sight. Anytime you can find an actual terrain or cover-related funnel between bedding and feeding, you have a dynamite spot. This will force the deer to come past in a predictable way and permit you to use the wind more effectively. Before going into the open timber to find a heavy primary trail, try to find natural funnels first: a bluff edge, the end of a ditch, a creek crossing, fencerow, etc. Timing: Stand #2 probably isn’t a great morning stand, but it is a lot better than the field edge. As long as you feel you can get in and out of the stand without being detected, you may as well try it on a couple of mornings. After the first week of the season you should leave this stand alone until the rut so you don’t cause deer to stop using the nearby bedding areas. Finally we arrive at the highest-risk stand location: the bedding area itself. Of course, you don’t want to hunt the bedding area unless you have already hunted stands along the field edge and the bottleneck to no avail. Forming the strategy: Unless you already have a stand up, there’s really no gentle way to find and set up this ambush. You need to bump the buck from his bed and get a look at both the deer and the location. Sometimes you can also use big rubs to reveal a buck’s bedding area. If you find a few big rubs in a location away from the primary food sources, you have a possible bedding area. Hopefully, the spot presents some tactical advantage that you can use to your advantage, and hopefully he comes back again in the next couple of days. Carry your stand when scouting so you don’t have to come back again until the morning of the hunt. Placing the stand: Whenever possible, choose a tree that will carry your scent out over a valley or ravine so there is little chance that he’ll smell you on the final approach. If you can’t find this perfect scenario, at least set up so the wind will blow your scent away from the most likely feeding areas. Like Stand #2, this stand should also be chosen with access in mind. You don’t want the buck to cut your trail, so approach using the back door—from the side away from the feeding area—and use any adverse terrain such as ditches and creeks to your advantage. Timing: This is strictly a morning spot. Don’t even think about hunting it in the afternoon. The spot can be productive at any time up until the rut starts, (at which time the bucks will abandon their traditional bedding areas) so hunt it as much as you please. Just realize that each time you hunt the spot you run the risk of educating the buck and pushing him onto the neighboring property. Bucks will never be more predictable than they are during the first week of the season, but they’ll also never be more sensitive to hunting pressure. 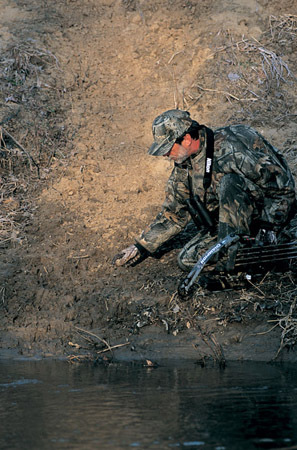 If you approach opening day with a plan, this period can be nearly as productive as the rut. Start at the feeding areas and work toward the bedding areas. It’s a simple strategy that will keep you in the action for a solid week.